Dorothy first fell in love with dancing during childhood when she attended monthly polka dances with her father in Worcester, NY, where she grew up in a Slovenian family. After she was married, her husband gave her a gift certificate for dance lessons as a Valentine Day’s gift. There was no turning back. She has performed locally in showcases and has competed in State and National Ballroom competitions in International Standard Division. Dorothy is a retired mathematics teacher, having taught in Norfolk and Virginia Beach Public Schools. She served as a mathematics department chairperson while working in NPS. Currently, she continues her love of teaching mathematics as a private tutor. 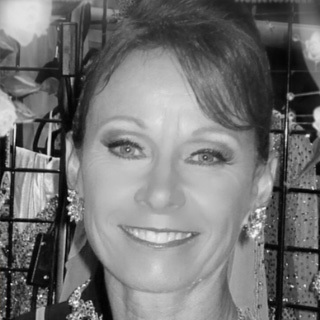 In addition to ballroom dancing, Dorothy enjoys waterskiing, wake skating and boarding, golf, biking, snow skiing, kayaking, gardening and playing the flute. She is a volunteer with Virginia Beach Adaptive Watersports, an organization that offers benefits of water sports to wounded warriors, disabled individuals and their families. As an Operation Smile Volunteer, Dorothy served as a student sponsor on a mission trip to Nicaragua. It is with great pleasure that Dorothy supports the Virginia Musical Theatre by participating in this dance event.